Since September 2014 he is Mayor of the Municipality of Orestiada. Member of P.E.D & DI.A.A.MA.TH. He was born in May 12, 1971 in the town of Orestiada. He is married and he has two children aged 10 and 12 respectively. 2011-30/08/2014: Municipal director. Head of the opposition. 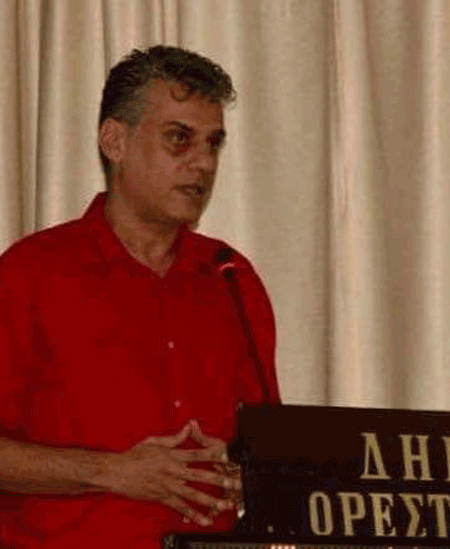 2010-2014: Vice president of Panhellenic Association of Physiotherapists (regional section of Thrace). 2008-2015: Scientific responsible of boarding school “Psychaspis”; member of the Board of Directors. Public relation manager of Panhellenic Association of Physiotherapists (regional section of Thrace). 2006-2014: Physiotherapist of boarding house “Psychaspis”. 2006-2010: A member of the Board of Directors of Panhellenic Association of Physiotherapists (regional section of Thrace). 2005-2015: President-Head of housing structure company “Psychaspis”. 2005-2009: President of MGS “Orestis” Orestiada (music-athletic club). 2004: Volunteer for the 2004 Olympic Games. 1997-2014: Owner of Physiotherapy Center. 1994-2005: Physiotherapist of MGS “Orestis” Orestiada.